My son loves Legos (and I do too). He can play with them all day long, imagining, constructing endless scenarios. It's not a big set by any stretch. However, it's now large enough that the joy of playing with Lego is diminished by his inability to find the right pieces in a timely manner. My computer science and engineering mindset kicked in. Is this a solved problem? Have people found a perfect way to sort and organize Legos? Is there a machine that does it already that we can buy? Google certainly return plenty of hits, but none of the results provide detailed analysis of the problem and the outline the solution trade offs. I see 4 dimensions to the problem..
1) Cost of sorting in time. 1a) Frequency of error due misplaced pieces. How quickly and accurately can a young child sort the pieces? I need to able to explain the procedure, and he needs to be to consistently apply the procedure and manage all the exception cases. 2) Cost of retrieval in time. 2a) Fun / imagination of the retrieval. 2b) Searchable by a child. Of course, it must be fast and easy to find the right piece. And just as important, the pieces are not so well sorted that the process of imagination is eliminated or diminished. One thing I love about Lego is that I don't know what I'm going to end up until I finish. The process of searching, and visualizing how each piece might fit into my current project creates this infinite possibility that makes Lego fun. So the searching and imagining the possibilities is an integral part the fun. I don't want take large part of the room so the solution should be compact, stackable, and easy to move around. I don't want to spend too much money to buy all the material to manage this system with storage boxes, label makers, etc. This is a classic computer science problem. How do you trade off cost of space vs time vs money? Of course, there is no perfect soluion, but I will describe the evolution of my solutions and some analyze on the pros and cons for each solution. This is actually a great solution. We used this method for 2 years. We dump everything out on the table with raised edges (Thomas the engine table is perfect). Play to our hearts contend, the put all the piece back into the bucket. Easy to sort, easy to find on the table, doesn't take much space, and cheap. - cost to sorting : 5 to 10 minutes for a full sort. - cost of money : < $5 for a Lego branded storage box. This worked for about 2 years until we have more then 3000 pieces. 2) The big bucket with multiple ziplock bags. Our first attempt to organize the Legos. We put different color pieces into its own ziplock bag. The ziplock bags are cheap. It's see-through so things are easy to identify. We dump all the pieces out to play with them the do a full sort each time. - cost to sorting : 1 hours for a full sort. - cost of money : < $5 for a Lego branded storage box. Pennies for ziplock bags. This was NOT a good solution because we have to pay the cost for all full sort after each play. The ziplock bags has a relative small opening so you can't easily access the pieces, even though you might be able to see it through the bags. So we had to dump all the pieces out for each play. The cost of a full sort is just too much. 3) Clear plastic shoe boxes sort by high contrast colors Lego colors and odd shapes. I spend hours in the Container store trying to find the perfect containers. There were so many choices. Ton of different craft boxes, tool storage boxes, document storage boxes, etc. In the end, the simplicity and scalability and low cost of this solution won out. The choices of 5 boxes is not random. Plenty of social experience that shows people can only easily remember 5 to 7 random things together at a time. I figured 5 or 6 boxes would be easily enough for a child to remember how to sort and retrieve. Here is the picture of the boxes stacked so it's very portable, compact, and easy to manage for a kid. 1) All the small single decorative pieces, Lego characters, and accessories goes into 1 box. 2) The large, and specialized pieces goes into 1 box. Tires, specialize frames, doors, windows, etc. - cost to sorting : 3 hours for a full sort. 10 to 20 minutes for partial sort. - cost of money : $2 per box, you can get much cheaper if you wait for a sale. There is a lot of good things to be said about this method, but it didn't last a very long time. To avoid the cost of full sort, I don't want to dump all the pieces out of the boxes. We search of the pieces inside the boxes and only do a partial sort of the pieces we actually used. This is huge savings in the sort time. The top of the boxes are very wide, so it was easy to access. The problem is that all the pieces with the same color blends together so it's hard to see and as you move the pieces around the big pieces floats to the top and the small pieces sinks to the bottom of the box. The more you search the harder it's to find the small pieces. Also, my son is a purist about the color, the shape and function of the pieces is more important. The average of 5 minute retrieve time was very frustrating. 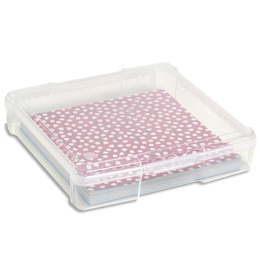 4) Clear plastic shoe boxes sort by shape and size. So lesson learned. Here is the new sort method. 1) All the small single decorative pieces, any one notch pieces, Lego characters, and accessories goes into 1 box. 5) full height or more pieces. - cost to sorting : 5 hours for a full sort. 10 to 20 minutes for partial sort. We are still using method after multiple plays. This is much more intuitive with how we play. I know roughly the kind of piece that I want. I can be as picky the color or not. Most of the time, once I find a piece that fits the situation, I use it. I might search a bit more to see if there is something better but I stop after a few search. The pieces are easier to find because they are all rough the same size and dimension so you don't have these sinking and floating effect for the small and large pieces. My son loves the character box. He is always making different characters doing different action and holding different tools / weapons. Everything is easy to find and easy to put away. I can see that he spend most of time playing with pieces here. Now at we are familiar with the sort method, I think we can scale this out to about 10 boxes and refine the separation a bit more. The wide flat pieces are still hard to find. The small 2 notch single row pieces are hard to find. I think we can use a different kind of box. The height of the shoe box is not efficient, and the top opening could be bigger. A wide flat box would be much better. I remember this 12x12 box from the Container Store at $8 each would be better next time. Anyone with a different sorting method or experience, please share. I would love to hear about it. As you've noted, grouping all of one color, even multiple shades, make it hard to find a specific piece. Grouping like shape/size together is better than sorting by color. Once you've grouped by shape/size, you can build clumps that take less space, but you can still see exactly what you want and easily get to it. Imagine a wall of 2x3 bricks, all different colors, but you can see exactly the one you want and get it easily. Our eldest is running down the path of sorting and managing his various sets now. I am trying to gently direct him, but do not want to just dive in and do it for him; he needs to work through a certain amount of this on his own. He's using clear Tupperware containers and shoe boxes; not ready to spend money and trap him in a system yet. Jim - Great tip on Box4Blox. I watched the video and looks like a great product. This is such an awesome engineering analysis of sorting legos. Impressive. Andy and Meesh.. thanks! Had a blast exploring and writing this article.